Every interaction is an opportunity to network not to sell. We went to a lot of networking events and conferences looking to sell our product and we couldn’t sell anything because other people were looking to sell us something. If you are an entrepreneur or business person, we would suggest sharing your story and having a mindset of how can you help them or partner up versus how can I sell you. This simple change has led to so many leads and opportunities for joint venture partnerships and collaboration projects. Our suggestion is to get out there specially if you are a new business. Get your name and brand out to the public. The amount of people who were willing to jump on board and help us in other ways beyond financially has truly been a blessing. I had the pleasure of interviewing Ashton and Brittany Harvey. Brittany is the Founder and CEO of Yellow Threads Co. She is also currently an oncology nurse who has been in the field for over 5 years. Brittany has been blessed with the opportunity to be a part of the story of some of the most amazing and inspirational people battling cancer. She finds her passion in educating and making sure patients have the resources needed to combat the side effects of treatment, and make sure the process goes as smoothly as possible. As a nurse she strives to take away the stresses that comes along with the diagnosis of cancer. Through Yellow Threads Co. she aims to continue making a positive impact in the cancer community inside and out of the clinic. Ashton is the COO and co-founder of Yellow Threads Co. he got his start in the medical field working in the industry for over 5 years specializing in orthopedics. Understanding that he wanted to make a greater impact outside of the clinic he decided to become a John Maxwell Leadership Coach and Trainer. He started teaching business owners and sales professionals the power of achieving significant through disrupting systems and developing a givers mindset. His Significant E.D.G.E Program gave him the opportunity to work with and learn from hundreds of entrepreneurs, businesses, and sales professionals from across the country. 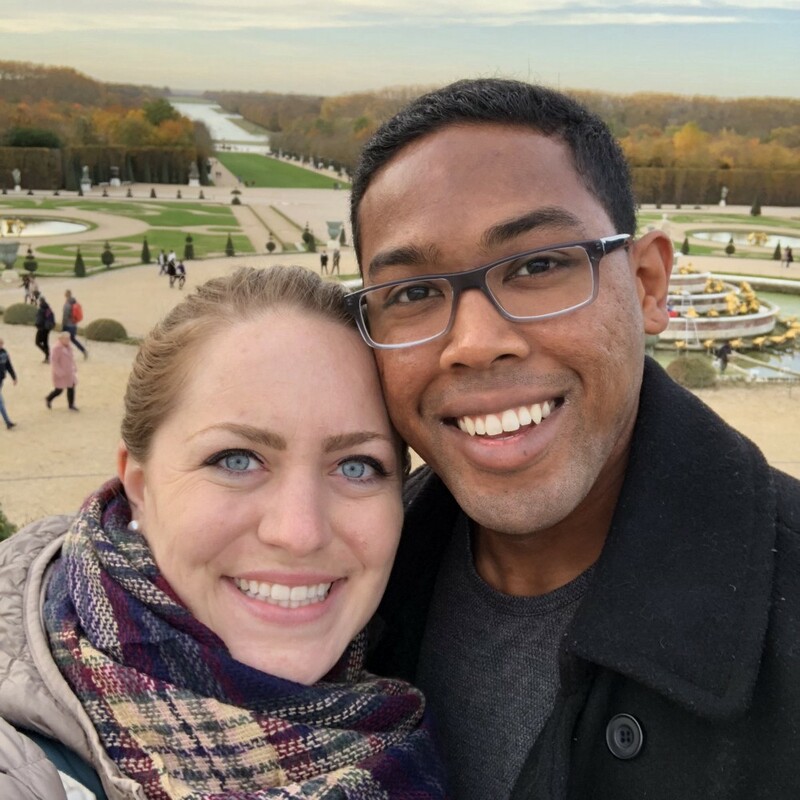 Now, Ashton is looking forward to working along side his amazing wife Brittany to utilize the skills he has learned in sales and marketing to grow a business that will impact millions of lives. Brittany: Ashton has always been an entrepreneur at heart, but I’ve always wanted to be a nurse my entire life! My love for cancer fighters began at Good Samaritan Hospital in Downers Grove, Illinois. From there I began travel nursing to all different locations and soon fell in love with outpatient infusion. I absolutely love getting to know my patients and do life with them and help them avoid as many side effects as possible. Through my travels I met my awesome husband Ashton while living in California. After getting married not long after we met, his job took us to the bold north of Minneapolis, Minnesota. Working in the mid-west the winter weather can be very difficult for patients, I became very aware of the struggle chemo patients faced when dressing for treatment. I started to notice that women would be coming into the clinic wearing baggy sweatshirts or really low cut V-necks all for the purpose of allowing me to have access to their infusion ports. Brittany: I realized there were not many options in the market that would allow women to wear something fashionable. So, Ashton and I decided to do something about it and that’s how yellow threads was created. At the time we were living in Minnesota, and we realized we wanted to produce here in the US, so we left our full-time jobs, and moved to LA to began working with local manufacturers out here. Brittany: I think working in an industry that you know nothing about was the hardest part! We were passionate about the purpose, but we had no clue how to bring it to fruition. Trying to developed a working prototype in the beginning would be the first hardest time we experienced. I had some basic sewing skills, so I created our first prototype… and it was rough! When we got to LA and began working with the manufacturers, we quickly realized that being the new guy on the block in one of the most competitive industries in the world was not going to be easy. We didn’t realize it when we got started but there is a lot more than meets the eye when it comes to creating an entirely new product that has never been developed and tested before. Its not like we can just take a shirt that already exist and modify it. We had to design the entire thing from scratch- choose the fabrics, trim, hang tags, and design a pattern that works! Navigating the fashion industry as a nurse was very difficult. We had quite a few setbacks and were unable to get clothing produced as quickly as we had been promised. There were multiple times when the shirts were promised to be done… and then find out a month later we were still not in production yet because other bigger companies take priority. Remember again we are new to the fashion industry, so most manufactures don’t focus on the small fish. We had been planning to have our pieces ready to be shipped out by October, and didn’t actually get our order until the beginning of January! I think we had to learn to be more flexible in the beginning of our business and it really challenged us to get creative and become better communicators. Ashton: Initially it was very difficult because we found out it takes a lot of money to design one shirt and manufacturing in the US is way more expensive that manufacturing overseas and we were paying for everything out of our own pocket. So financially we had to succeed because we had a lot of skin in the game. Our mindset quickly changed after introducing the product to patients as well as the nursing community, we had such a positive response that we knew we had to follow through and get the shirts out to the public! Brittany: We both also grew up with hard working parents that instilled a positive work ethics into us. Both Ashton and I come from entrepreneurial homes… both our Dads are small business owners, so we knew things don’t always run as smoothly as we would like. We also knew that there were patients counting on us. We had multiple people donate to our cause, so we were able to do a 100 shirt give away to women across the country going through treatment. We knew those women were counting on us and we refused to let them down! As we started helping more people, our vision for yellow threads became bigger and bigger to the point were now we are attracting people to us and looking for people who also believe in our vision and mission to inspire hope and confidence to the millions of people diagnosed with cancer every year. Ashton: What drives us now is the feeling that we need to finish what we started. We are so pumped for the coming years. Believe me when I say, we are just getting started, we are looking forward to our men’s and kids lines being launched this spring, along with the all the other treatments that we will be designing clothes for in the future! Ashton: When you have a business that not only is a product, but truly serves a purpose of bringing joy into the lives of those who need the support it makes it easy to stay on course. By all means, we are still at the base of the mountain in comparison to where we aim to be, but the progression from idea to actual product and celebrating the small wins like our first shirt ever sold (who was Brittany’s mom) is really what gets us through the hiccups and pitfalls. We made a commitment to not stop. Like anything you do in life if you stop it makes it that much harder to get moving again. I think one of the biggest motivators that keeps us moving to this day is our dream of finally being able to spend more time with each other as a family. Brittany: I agree, and to add to that when I remember when we finally got our product ready to go and we made sure that as soon as we had product that we would send out the shirts to the 100 people that had won the drawing. We worked our butts off to make sure the shirts went out to each person with a hand written note. The very first person that posted a review on Instagram about the shirt seriously made me ugly cry. She was so excited and so thankful to the people who had donated a shirt to her! She was rocking the shirt and said she was so joyful. To know that all our hard work brought joy to someone literally fighting for her life was unbelievable. It confirmed that everything we had been stressing about and working hard for was worth it… even to touch one life on the other side of the country. Brittany: We have had such an amazing journey so far. Being in business really changes the way you look at life. We have so much more drive to meet new people and find ways we can add value to other companies. We have a few events coming up. We’ll be in Anaheim the beginning of February for the OC Heritage Parade. We’ll also be headed to Austin, TX in March for the Young Survivors Coalition- which is a support conference for young women going through Breast Cancer. We are so excited to help support these women through this journey! Ashton: We are still growing every day, we are constantly faced with new opportunities for growth from marketing strategies to financial planning. We are in the process of developing a men’s and kids line of clothes for roll out in the spring! Our hope is that we start to gain more traction over the next year to become more of a household name for stylish and fashionable clothing that most importantly serves a medical function if needed. Our vision is to expand and accommodate every medical condition that may need specialty alterations so that every person can truly define themselves by who they are, not their diagnosis. Brittany: When we first started out, we didn’t know that the manufacture needs to keep all our sample clothes, but we needed to get product feedback. Before we understood that we had sent our only samples out to some women going through treatment for them to test out the shirts and see what feedback they had. Well, we quickly realized that these women thought the shirts were a gift… meaning we almost lost our ONLY samples! We were very embarrassed to ask for them back but sent them a complimentary shirt as soon as we got our first shipment. We are much clearer with our communications now. Ashton: We are more than just a clothing company. We aim to change the way the fashion world defines creativity. Creativity and innovation should be about how you change peoples lives not how many diamonds you can put on a dress. Yellow Threads Co. stands out because its a brand created by a nurse that works intimately with this population. Meaning, every part of the shirt was designed with the patient’s needs in mind. In addition to that, for each shirt that is purchased, we donate $5 to cancer research and institutes. Brittany: Not to long ago, we ran into a young woman at a conference who was a breast cancer survivor, and when we explained what we were doing, she teared up. We had recently created our “mommy ‘n me” option (matching mom and daughter shirts) and she said that while she was going through treatment, her daughter refused to leave her side. She said she wished these shirts would have been available while she was on treatment because she thinks it would have brought her daughter so much comfort to be able to match her mommy. We are a brand that aims to make a positive impact not just in lives of the people wearing our product, but the people connected to them and the community around them. 1) Get excited about the ALL the positive things. It doesn’t matter how many things have gone wrong in your day… if you are able to look at the positives it will re-enforce what you are doing and empower you to keep pressing forward. 2) Take time to relax. Everyone talks about grinding hard for the short run to enjoy the long run. We’ll tell you that is the number one reason for burn out if you’re not prepared for it. Being around cancer we realize that life is short you really should enjoy the journey all the way through. So if you are looking to start a business work hard when you are working, but when you are not relax and enjoy the company you have, and the experience you are in. 3) Focus on helping people not the money. Everyone wants the big mansion, fancy cars, amazing travel and that’s all good we are huge proponents for having big dreams we have big dreams and goals for ourselves and as a family. The process of getting there is different for everyone, but when you focus on improving other peoples lives instead of the money that you can gain… your life tends to be improved. Question is how are making a difference in the community? How is your business improving the lives around you? When you are able to focus on those question then all the hard work is worth it and the things you want most starts to become attracted to you. Brittany: We have had a lot of mentors and coaches that have helped us out along the way, but we are so thankful to our parents. My mom was the first one to purchase a shirt, while Ashton’s Mom agreed to let us use her as a model in our promotional materials. Ashton’s parents allowed us to stay with them when we first moved back out to California! We learned so much from our parents as far as how to reach our market, how to set up a booth, to remember chairs when have a 10 hour day at an event, to put your website on all your promotional materials, and how to negotiate for what you need. We are so thankful for their advice and guidance. Ashton: Our goal is to inspire people to develop a giver mentality. With every interaction that we have with people we are always trying improve their day rather than take away from it. With our company Yellow Threads Co. bringing goodness into the world is built into the product haha. We mentioned before that we also are able to give away shirts and donate $5 to cancer research and cancer institutes that support people going through treatment. We are firm believes in making our dollars make a difference. 1) Starting up a run of the mill buy from china, sell on amazon business is easy. Creating your own business from scratch is hard and it costs a lot of money upfront if you’re a product based business! When we first started Yellow Threads co. we didn’t know that it cost $2,500+ just to create one shirt and that was a generous number because the manufacture that we were working with liked our cause. On top of that we needed to buy all the products ahead of time and manufacturing in the states it gets very expensive almost vomit worthy expensive! Prime example our shirts cost in the US is about $23 just for the shirt alone! Not the packaging or anything. In china a shirt like ours cost at max $10. Non the less we wanted American made products, but the hard truth is most people don’t want to pay American made prices. This is something we have to deal with at the end of the day. It would have been so much easier if someone would have taught us about getting business lines of credit before getting started that’s for sure! 2) Start marketing your product before you have product. We started out trying to get a kick starter going, and we were filled with hopes that it was going to do great! When we reached the end of the Kickstarter we didn’t even reach 10% of our goal. It was devastating. We thought maybe this product was not as good as we thought it was, or that other people hyped it up to be. On top of that, we didn’t do any marketing ahead of time because we felt like a Ponzi scheme, pay us money now and we will give you the product sometime in the future haha. The worst thought we had was what if we start sharing our products with everyone, someone is going to come in and steal our idea. We were in our own heads! In the end we should have marketed more before having any actual product and now that we have products we are scrambling to get it out the door! If you have a new product or your developing a new product don’t be afraid to share it with the world. Most people don’t have the stamina to steal your product idea anyways, and if its good enough people will pay ahead of time to buy it! 3) Invest in coaches NOT programs. One thing that we personally started to realize is the power of mentors… not programs. Having someone there buy your side every step of the way is worth its weight in gold! We bought into a lot of online programs and yes it was great information, but it was so broad that at the end of the day we still ended up trying to figure things out all by ourselves and we just wasted the money on a program. So if you are going to invest in a personal development program make sure your investing into a person who will be able to support you, answer any questions, and guide you through every step that you are going through. 4) Every interaction is an opportunity to network not to sell. We went to a lot of networking events and conferences looking to sell our product and we couldn’t sell anything because other people were looking to sell us something. If you are an entrepreneur or business person, we would suggest sharing your story and having a mindset of how can you help them or partner up versus how can I sell you. This simple change has led to so many leads and opportunities for joint venture partnerships and collaboration projects. Our suggestion is to get out there specially if you are a new business. Get your name and brand out to the public. The amount of people who were willing to jump on board and help us in other ways beyond financially has truly been a blessing. 5) Emails are your contracts, get everything in writing, be very clear on expectations. When we first started out with our manufacture, communication was very lackadaisical and we ended up spending a lot of time correcting mistakes that could have been dealt with if we would have clarified our vision via email or phone. We started to realize the power of communication and clarifying EVERYTHING! We started to get everything in writing after every meeting or conversation. We did this for three reasons 1) To keep every party accountable for their actions, because we are dealing with people and deadlines, so if you are a business that is promising something to your customer you make sure that you get things on time to them. 2) Everyone is clear on next objectives, and steps in the process. 3) Leverage, if things are not getting completed on time emails give you leverage to end contracts or negotiate better pricing. It doesn’t matter if the person you are working with is your best friend make sure that if you are going into business with them and you are collaborating it is always a good idea to get everything down in an email or writing to talk about what is expected from each party! Ashton: The Understanding Movement! A movement that is focused on our differences for a positive purpose. Naturally we are all looking for people who look, sound, and think like us because it’s a defense mechanism to keep us “safe”. The problem with this is that it also keeps others away and makes people feel isolated. We would like to create a movement of understanding. Why is it that we cannot talk about religion or politics at the kitchen table? Let’s change that. We all do too much talking. My parents always told me the secret to life is to listen. A lot of us hear, but we don’t understand or we don’t want to. If we start a movement of understanding, people would be more open to others point of view and when we do that… people start to collaborate and innovations like Yellow Threads Co. would become more and more common.